El Departamento de Enfermedades Intersticiales de la ALAT tiene el agrado de presentar la nueva Guía para el Diagnóstico de la Fibrosis Pulmonar Idiopática, publicación oficial de la ATS, ERS, JRS y ALAT, publicada el 1 de septiembre pasado en la American Journal of Respiratory and Critical Care Medicine. Un comité de prestigiosos expertos, con 29 integrantes de las sociedades mencionadas más representantes de los pacientes con fibrosis pulmonar idiopática, concluyeron este documento que compartimos a continuación. Saludamos a los Dres. 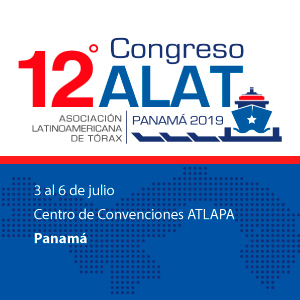 Moisés Selman e Ivette Buendía, quienes representaron a nuestra ALAT en la elaboración de esta Guía de Práctica Clínica. 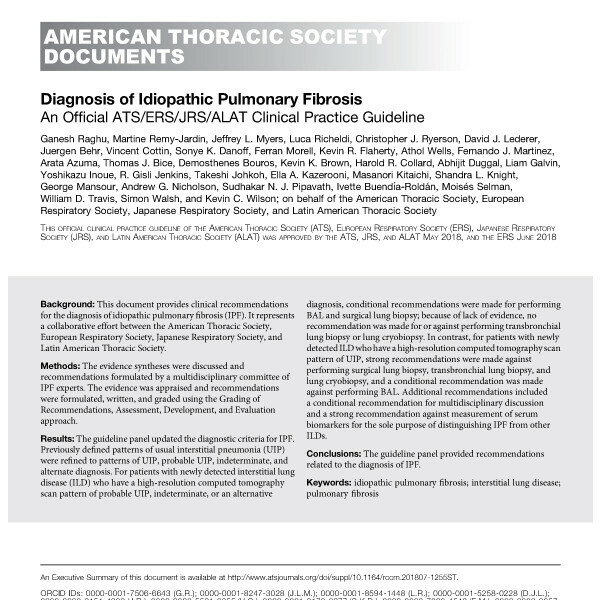 Background: This document provides clinical recommendations for the diagnosis of idiopathic pulmonary fibrosis (IPF). It represents a collaborative effort between the American Thoracic Society, European Respiratory Society, Japanese Respiratory Society, and Latin American Thoracic Society. Methods: The evidence syntheses were discussed and recommendations formulated by a multidisciplinary committee of IPF experts. The evidence was appraised and recommendations were formulated, written, and graded using the Grading of Recommendations, Assessment, Development, and Evaluation approach. Results: The guideline panel updated the diagnostic criteria for IPF. Previously defined patterns of usual interstitial pneumonia (UIP) were refined to patterns of UIP, probable UIP, indeterminate for UIP, and alternate diagnosis. For patients with newly detected interstitial lung disease (ILD) who have a high-resolution computed tomography scan pattern of probable UIP, indeterminate for UIP, or an alternative diagnosis, conditional recommendations were made for performing BAL and surgical lung biopsy; because of lack of evidence, no recommendation was made for or against performing transbronchial lung biopsy or lung cryobiopsy. In contrast, for patients with newly detected ILD who have a high-resolution computed tomography scan pattern of UIP, strong recommendations were made against performing surgical lung biopsy, transbronchial lung biopsy, and lung cryobiopsy, and a conditional recommendation was made against performing BAL. Additional recommendations included a conditional recommendation for multidisciplinary discussion and a strong recommendation against measurement of serum biomarkers for the sole purpose of distinguishing IPF from other ILDs. Conclusions: The guideline panel provided recommendations related to the diagnosis of IPF.